In 2008, DPIC conducted a comparative analysis of death sentences imposed across the United States in the 1990s versus the first decade of the 2000s. 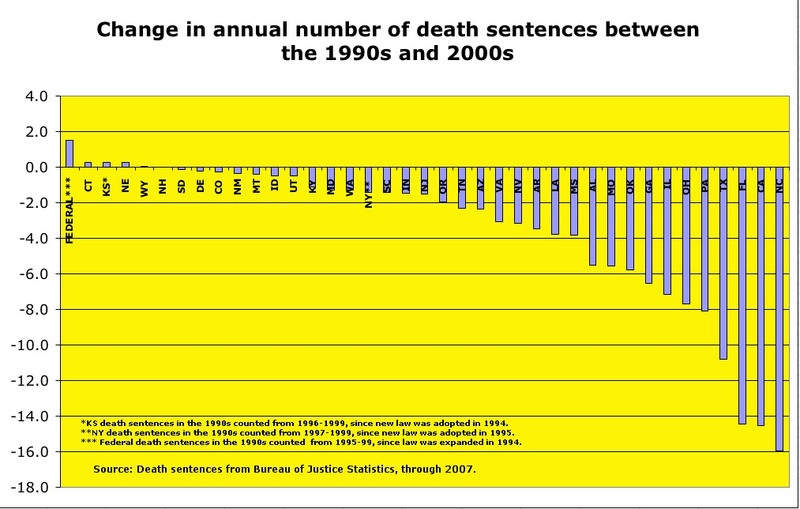 We found that, on a percentage basis, death sentences in the country dropped 62% between 1998 and 2007. Doubts about the reliability of the death penalty coupled with the availability of life-without-parole sentences likely contributed to that drop. The overall drop in death sentences during the 2000s occurred even though the murder rate remained approximately constant during the seven years of the decade that we studied. In 2007, the last year for which data were available, the national murder rate was 5.6 murders per 100,000 people, a small decrease from 5.7 in 2006 and a small increase from 5.5 in 2000. A notable exception to this pattern was the federal death penalty, where the average number of death sentences had increased since 2000. Several important factors contributed to the increase in federal death sentences during this period. First, the federal death penalty law was expanded in 1994, so more federal offenses were death-eligible in the 2000s than in the early 1990s. Second, Presidential administrations changed, and the Bush administration, inaugurated in 2001, put an emphasis on using the federal law more broadly. See Sentencing. Posted Dec. 19, 2008.